JK Rowling really needs to stop adding context to her character. As the author continues to make money out of her Harry Potter-based books and movies, she has also been saying things that are angering Harry Potter fans. As if the Fantastic Beasts and Where to Find Them movies weren't enough for that! Sometime back, she had mentioned how she regretted making Ron Weasley and Hermione Granger a pair. Now her latest statement about Albus Dumbledore and Gellert Grindelwald is causing much uproar in the wizarding community. 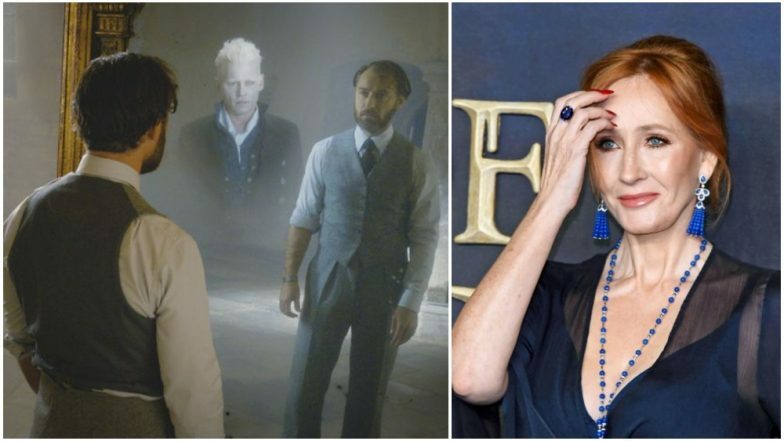 Fantastic Beasts The Crimes of Grindelwald: 10 Secret Harry Potter Easter Eggs You Should Not Miss Out In The Movie (SPOILER ALERT). Harry Potter fans know that Hogwarts' greatest headmaster, Albus Dumbledore, and the Dark Wizard, Gellert Grindelwald, were friends in their teens, before a dark incident drove a wedge in their friendship. The books and the movies did not claim this bonding to be nothing more than platonic. However, in a discussion with fans, JK Rowling had claimed that Dumbledore was gay and he was in love with Grindelwald. This revelation opened a hitheterto unexplored facet about the headmaster we loved, and cleared certain things about his personality (why he waited so long to defeat Grindelwald; why he never married etc). JK Rowling Reveals Dumbledore and Grindelwald's Relationship Had Sexual Dimension, Leaves Twitterati Divided. Now in the special features for the upcoming Fantastic Beasts: The Crimes of Grindelwald Blu-ray, Rowling added another new angle to this relationship. She now claims that there was a 'sexual dimension' in Dumbledore-Grindelwald affair. She said, “Their relationship was incredibly intense. It was passionate, and it was a love relationship. But as happens in any relationship, gay or straight or whatever label we want to put on it, one never knows really what the other person is feeling. You can’t know, you can believe you know. So I’m less interested in the sexual side – though I believe there is a sexual dimension to this relationship." Fantastic Beasts The Crimes of Grindelwald: Who is Aurelius Dumbledore? Trying to Figure Out The Final Twist (SPOILER ALERT) With Fan Theories! JK Rowling's new observations have not gone down well with some Harry Potter fans. They feel that she is coming up with unnecessary context just for the sake of it, while there are others who have criticised her for not adding this angle in the books to play safe. And then there are others, who have now made jokes on JK Rowling's habit of saying 'random' stuff when no one's asking. Interestingly, Dumbledore and Grindelwald's relationship, or rather the aftermath of it, will be explored in the Fantastic Beasts and Where to Find Them series. Judel Law had played a young Dumbledore in the second installment, Fantastic Beasts: The Crimes of Grindelwald, while Johnny Depp played Grindelwald.